Nowadays many terms encountered in 64 bit, 32 bit pasa an operating system. Actually what is the difference between 64 bit and 32 bit?? The difference is the amount of information that can be handled by the PC processor at any given moment. While the computer is designed for 64-bit operating system has the potential of computer performance is much larger, so it requires a fundamental change in designing a software for 64-bit operating system. 64 bit atau 32 bit ??? From the word “bit” refer to the way computers handle information in binary code, where all the data is recognized as a series of digits number consisting of 1 or 0. Each digit is counted as a single bit, which means 32-bit processor can process 32 digits at once and 64-bit processing Damat 64 digits at once .. can you imagine?? Software for computers with 32-bit processors, including operating systems such as Windows, have specific information to suit the type of processor, the same also applies to 64-bit processors. Microsoft produces editions of Windows XP and Vista 32-bit and 64-bit and do the same on Windows 7. There is also a mathematical limit signifkan the two types of processors . 32 – bit processor can only work with a maximum memory capacity of 4GB and achieve this is usually restricted to any one DIMM 2GB memory . While 64 – bit processors in theory , be able to work with a memory capacity of up to 17 million DM . 64 – bit processor is also capable of handling process up to two times faster .Memory limitations of 32 – bit processor starts to look clear when Windows Vista , which requires large memory capacity and often difficult to run multiple programs simultaneously , even when using a memory with full capacity up to 4GB though . Previously , it was impossible any one program requires more than 2GB of memory , but beberepa moderan video games have now exceeded those limits . The reason is what makes the 64 – bit processor becomes very pupuler not just trendy , so the number of customers who are interested in buying a 64 – bit operating systems is increasing . 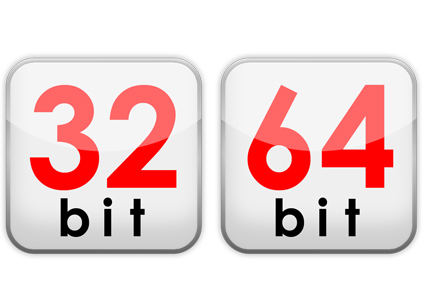 Windows 64-bit edition can run most software designed for 32 – bit editions through special kompatibitas mode , but the results can vary widely . Using a 64 – bit operating system can also cause a bit of a problem in the driver , which is a small piece of software to coordinate any hardware device with an operating system . I hope the information above can help my friends be able to draw their own conclusions where appropriate pirsi with us ..